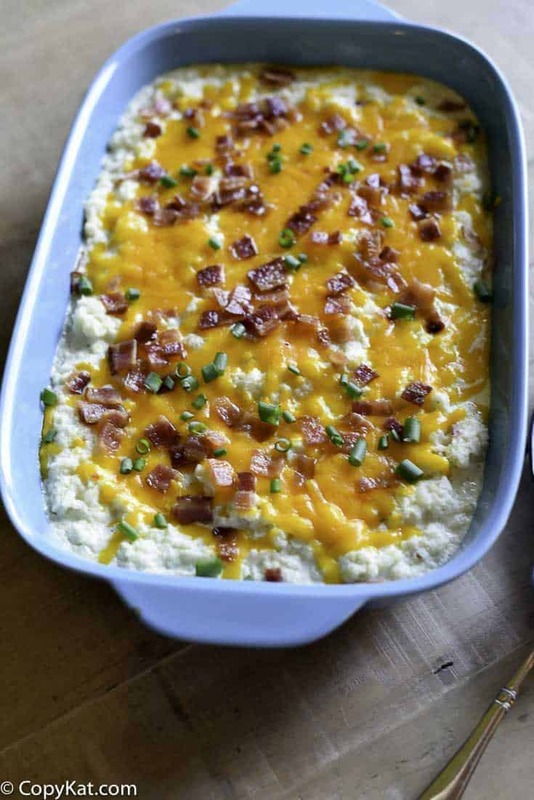 Home » Side Dish Recipes » Try this Low Carb and Keto Friendly Twice Baked Cauliflower, you won’t miss mashed potatoes. Try this Low Carb and Keto Friendly Twice Baked Cauliflower, you won’t miss mashed potatoes. Twice Baked Cauliflower is the perfect side dish for when you are on a low carb or a keto diet. 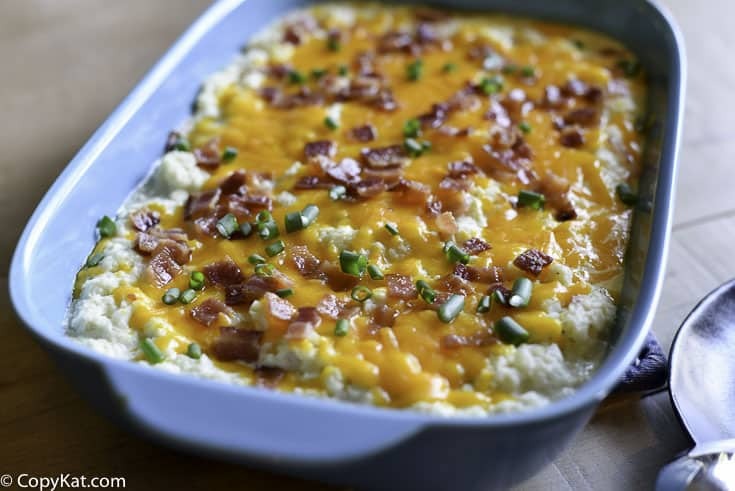 This twice baked cauliflower with bacon can taste a lot alike twice-baked potatoes. I can’t tell you how many times I have made this Twice Baked Cauliflower lately, but it has been more times than I can count. I got the inspiration for this recipe from Kalyn, at Kalyn’s Kitchen. She is one amazing low carb food blogger. Everyone around me has been on a keto diet, and sometimes you just miss old favorites like mashed potatoes. I am not one for saying something tastes like something else, I want it to taste close. I really think you can turn cauliflower into a good substitute for mashed potatoes when you mix in a few more ingredients. For this recipe, I steam the cauliflower, in the video, I show you how to do this with an Instant Pot. You can steam cauliflower in your favorite way, that may be with a steamer, or perhaps you will want to dig around in your pantry for the steamer insert that came with your pot and pan set. For me the real secret in this recipe is overcooking the cauliflower. If you overcook it until it is soft, it will have the texture of potatoes without all of the carbs. So normally I steam vegetables for about 4 to 5 minutes in my pressure cooker, for this one, I steam 7 minutes when I want the cauliflower to be extra smooth and creamy. You can mix in a variety of cheeses, some chopped onions or chives, bacon, and you can play around with your spice and herb blends. I love a smoked cheese in here, it really adds something extra to the recipe. Enjoy this low carb and keto friendly cauliflower dish that tastes just like twice baked potatoes. Steam Cauliflower in until soft. In the Instant Pot I recommend 7 minutes for super creamy cauliflower, and 5 minutes if you don't mind more texture. Perform a quick release on your Instant Pot. Mix with a blender until smooth. 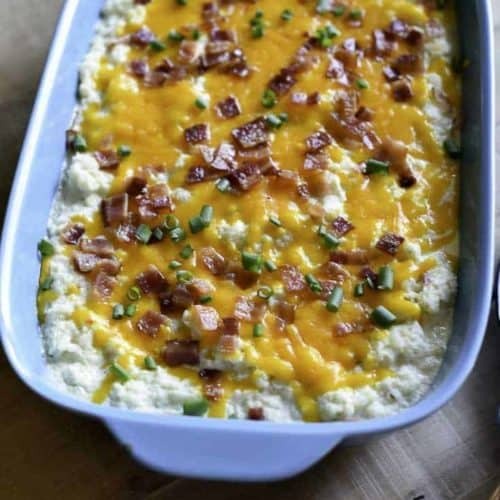 Place in a 2-quart casserole dish and top with additional cheese and bacon. I am just learning about the keto diet this week. my surgeon suggested I do this to prepare for an upcoming procedure. to say I am overwhelmed is an understatement. Your recipes are awesome and I appreciate your guidance along this learning journey. Love cauliflower and spaghetti squash and am so happy to see they are approved to eat. thanks you so much! In video it appears you are putting all ingredients in instant pot. If so I would like to have your recipe for cauliflower prepared this way. Do you mean you want the recipe on how to steam cauliflower? Thank you for this, I needed a new side dish. Stemmed broccoli gets old. Can’t wait to try it! I really like cauliflower, this recipe is perfect for me. Would love more keto diet recipes please!